As if there isn’t enough hardware to hook up to your RS232 equipped computer, now you can build your own. It was a nice thought to build Arduino boards with a USB port for serial communications and programming, and even nicer that it can be equipped with an RS232 port for communicating with our Ataris. You’ll need an 850 interface or a PR:connection hooked up and running on your Atari 8-bit. The ST has an on board RS232 port. If you have hooked up a modem or set up communication to another computer using a null modem cable, you can hook up an Arduino. If you haven’t, a “can do” attitude will be a big help. 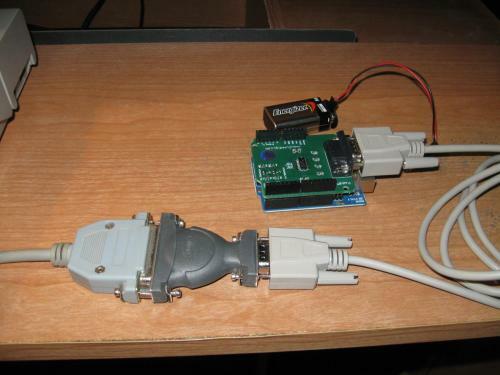 There are two ways to set up a RS232 port on the Arduino. 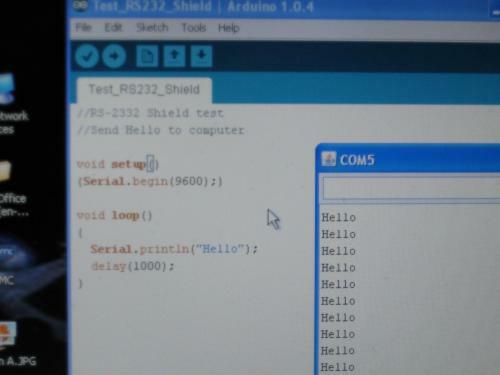 The first is to use a RS232 shield and the serial communication software that is programmed on the Arduino chip. This software is initialized when the Arduino board is powered up and uses digital pins 0 and 1 hooked up to the USB hardware. The second way is to use a software serial library that can be configured to the digital pins of your choice. The RS232 shields plug into the Arduino board and are set up to use pin 0 and 1. The shield will need to be removed to give the USB port access when down loading a program and then re-inserted to execute the code. Some have found this inconvenient and opted to modify the shield or use option 2. Option 2 is to purchase an RS232 to TTL converter board. Then wire it to the Arduino pins. You still have the option of using the built in or software serial library depending on which pins you use. You will still have to unplug it if pins 0 and 1 are used. I chose to start experimenting with the shield on the Atari 8-bit. Step 1. Program Arduino to output to serial monitor. Plug the Arduino into USB port of the computer for programming. Download the following program to the Arduino. Open up the serial monitor and look for “Hello”. Once you see that hello is being received from the Arduino through the USB port you are ready for step 2. I have been using a USB to Serial converter to null modem my Net Book to the Atari. It’s a good way to add a RS232 port if one is not built in. To verify that the shield is working. 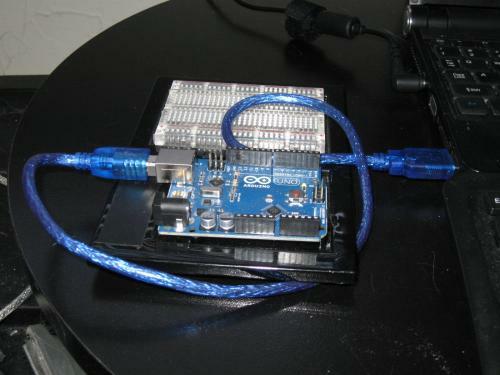 Disconnect the USB cable from the Arduino. Mount in the RS232 shield onto the Arduino board. Power up the Arduino with a battery or wall wart. Plug in the shield to the RS232 port. Watch the Arduino serial monitor for the “Hello” data stream. The COM port number for the converter may be different than that of Arduino board. That’s just one of the things to check. When that works try receiving the signal with your terminal program. I use Hyper Terminal to monitor the COM port. Step 3. 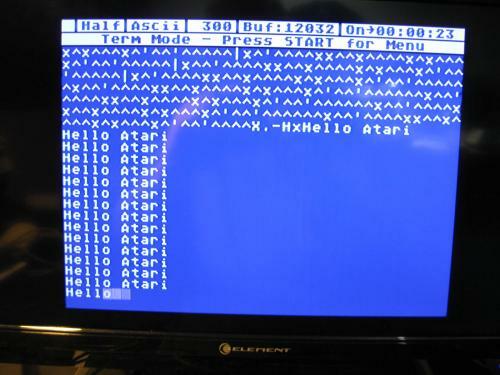 Connect Arduino to the Atari. A couple of changes were made to the Arduino program. The Atari can handle 9600 baud rate but at 300 baud it seemed to be easier to troubleshoot. Boot up the Atari with the serial port handler(R:) and terminal program. Bob Term is my program of choice. 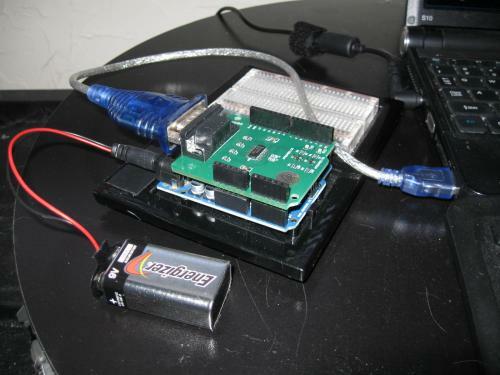 Hook up the Arduino to Port 1 and power up. Set the Baud rate to 300, Translation to ASCii, and Duplex to HALF. Or whatever you need. The biggest problem was getting the cabling right. A DB9 male to male connector didn’t work. The Atari port is not wired the same as the port on the Arduino or IBM. Adding the Null modem cable didn’t work. Mapping the pins and cable connectors would have been the good idea but trying the following worked. Now, if you’ve read this far and have your Atari talking to the Arduino, chances are you’ve thought of a hundred things to try. Somewhere out in the future, I’m hoping someone builds an 850 emulator. All you need is half a SIO cable, Arduino, and RS232 shield. Oh…….. and a bit of Arduino programing. www.cutedigi.com - find reviews of shield with some helpful hints. 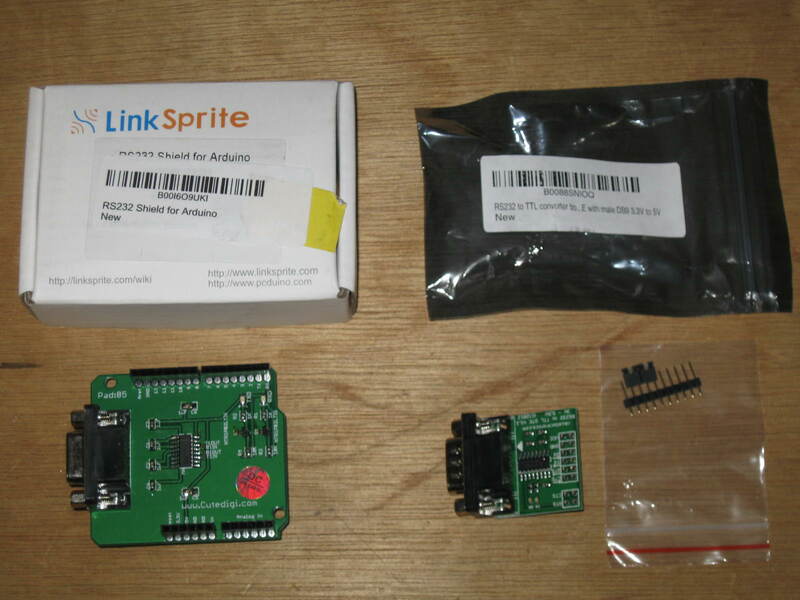 www.linksprite.com/wiki -> open source projects ->1.1.9 Others Shield -> RS232 Shield of Arduino. Schematics and view example code. Monk, Simon, Programming Arduino, Getting Started with Sketches, McGraw Hill, 2012.